You know, once in while, it’s OK to eat a meal full in calories, saturated fat, salt and sugar in three bites. At the end of the day, you’re running three times per week (*cough*). And most importantly the calories your brains burn while working very hard does the job. This morning, I tried the veggie breakfast roll from Pret a manger . “Eggs, roasted tomato, ketchup, BLABLABLA, salted butter”, the description says. “That works for me! ” said empty stomach. So I had one bite of Pret Veggie Breakfast Roll. First bite: Warm. Well seasoned. Bread’s fine. Second bite: Mouth reaches roasted tomato. Juicy.Tasty. 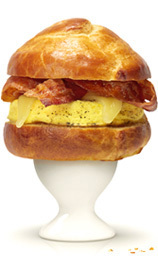 Third bite: There is plenty of eggs but you don’t notice it that much because of the other ingredients. Fourth bite: Salted butter starting to kick in. You suddenly feel sleepy. Will I try it again? If I’m starving, have been exercising and I ran out of cereals AND Pret A Manger ran out of croissants, I might think about it.